Do You Care If Ball Players Use Steroids? Polls Say Fans Do : The Two-Way There are more reports about players using performance-enhancing drugs. In the past, polls have shown that many fans do care and don't like to hear that the stars might be juicing. 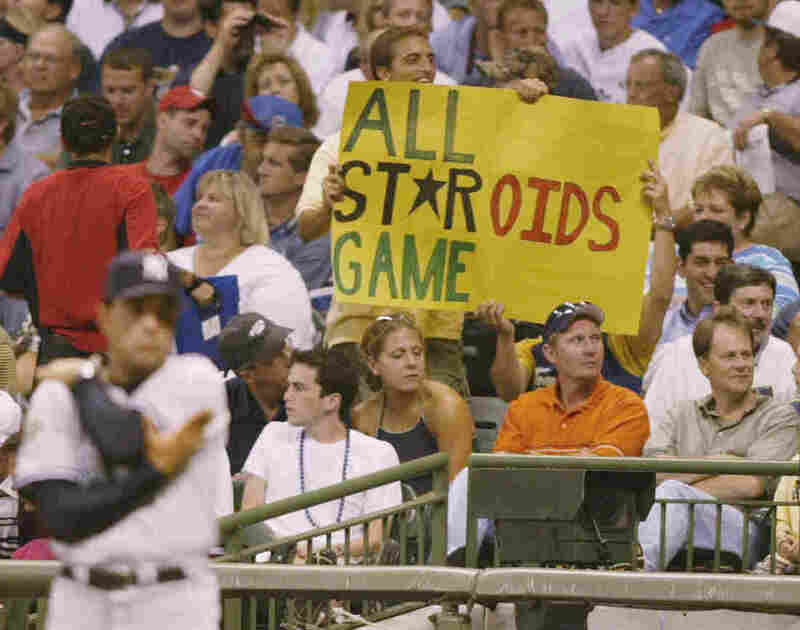 A fan raises his objections at the 2002 Major League Baseball All Star Game. -- A February 2009 CBS News/New York Times poll in which 60 percent of those surveyed said it matters to them "a lot" if baseball players use steroids or other performance-enhancing drugs. Of the rest, 29 percent said it matters to them "a little." Only 9 percent said it matters "not at all." That poll also asked, "if it is proven that an athlete used steroids at the time he or she set a major record in a sport, what do you think should happen to that record?" The responses: 32 percent said the record should be eliminated; 47 percent said that it should be kept, but with a note attached saying it was set when steroids were in use; and 18 percent said it should be "kept like any other" record. -- A February 2009 Associated Press/GfK poll in which 62 percent said they take baseball records less seriously than they used to because of allegations about performance-enhancing drugs. Only 35 percent said the allegations had no effect on their view of baseball records. -- A March 2005 ABC News/ESPN poll that showed 62 percent of those surveyed said players' records should be erased from the record books if they used performance-enhancing drugs. What should happen to a player's records if he's found to have used performance-enhancing drugs? Do the allegations about baseball players' use of performance-enhancing drugs make you?